Blendenzo’s custom cursor tutorial does a great job at providing us with a simple way to add custom cursors to our games. But what if we want it to do more? What if we want to control the sensitivity, or the area that the cursor is in. Well, read on as we return to our Duck Duck Moose game to improve the cursor control with a custom cursor class. We’ll start a bit backwards, by looking through cursor.py and what it does before moving on to how to use it. I placed everything in it’s own class that extends the KX_GameObject so that it can easily be applied to a number of games and the class can be extended to suit needs. It’s designed to be passed the KX_GameObject that is functioning as a cursor. assert isinstance(limitList, (list, tuple)), "Limits must be a list"
assert len(limitList) == 4, "limits takes a list of 4 integers [x1,y1,x2,y2]"
We treat the cursor exactly like we would if it was a first person camera: keep the mouse cursor centred and measure movement from the centre position. We can then multiply the distance moved by a sensitivity value (self.sens) and add the result to the pseudo-cursor’s position. This task is handled by the methods .centreRealCursor(), .getMovement() and .moveCursor(). For the pseudo-cursor to function as a real cursor we need to keep track of it’s position in the screen space. This is done using the KX_Camera method .getScreenPosition() and is saved in the class variable self.cursorPos[x,y]. The main work is done in .mouseEvents(). This method looks for active events and applies the appropriate function. The methods for events are deliberately left blank so that you can define the action that occurs (we’ll see how later) as each game will handle events differently. The only exception is .onCursorMovement(), which is bound to .moveCursor() unless otherwise specified by the user. For the cursor to interact with the scene the .getCursorOver(prop=””) method is able to return the object that the cursor is over, or None if there isn’t one. You can pass a property so it only picks up objects with that property. Now, here’s where things get a little tricky. If the script is running in an overlay scene, then, by default, the .getCursorOver() method will look in that scene. To specify what scene we want to look for mouse over objects we need to see the variable self.searchScene to the scene we’re after. This just takes the scene’s name as a string, the class will do the rest of the work. Finally, this only works with a scene that has a camera and the camera must be perspective. Orthographic cameras will not return the correct object the mouse is over (this is down to a bug in blender). By being able to set the search scene, we can keep our overlay camera in perspective mode, while allowing us to make sure we’re looking in the right scene. The Cursor() class allows for the setting of limits for the cursor’s operation. By default, this is the game screen. We can set them by assigning a list of 4 integers to the property .limits ( ie. myCursor.limits = [x1,y1,x2,y2]). These values are percentages of screen space. So .limits = [10,10,10,10] would create a boarder 10% of the screen size where the cursor cannot enter. Using percentages means that the cursor’s area of operation remains the same regardless of the screen size. Create a new scene, we’ll call it ‘HUD’. 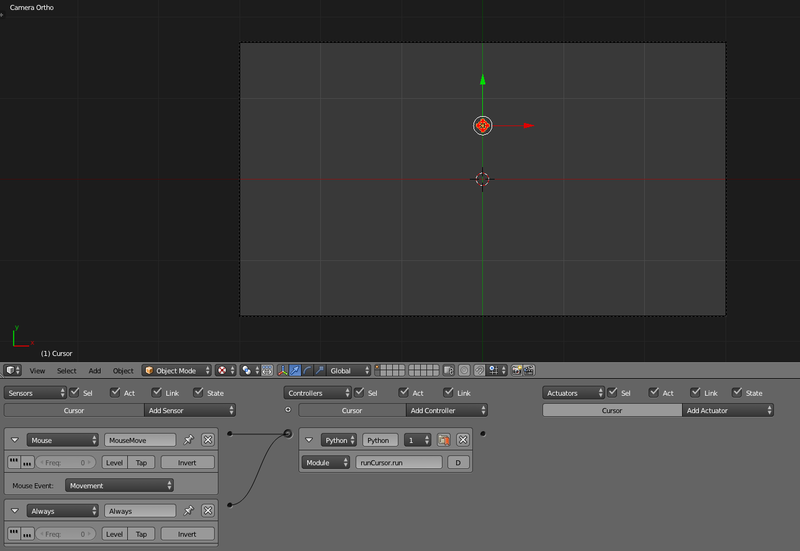 In this scene add your cursor object. Make sure that the front of the cursor (what the player sees) is facing up along the world’s Z axis. Now add a camera. Position your camera above the cursor object so it’s looking down the Z axis. All going well, when you look down the camera the Y axis should be up/down for the cursor and the X axis should be left/right. We can now import cursor.py and create a new cursor object. In doing so we pass the KX_GameObject to the Cursor() class and assign the value back to own. We can still access all the usual game object methods through own, only now it can also use the Cursor() methods too. First, we define some event actions. The first is a left click. Here, we use the .getCursorOver() method to grab an object that has been clicked on. There are now numerous things we could do with this object. In this example, it sets a property on the game object to True so the object knows that it has been clicked on and can respond appropriately (in the duck duck moose game this is done through the use of property sensors). Finally, we assign our new leftClick() function to the cursor’s left click function (line 26). We’ve also got a hover action. This combines the .moveCursor() method along with the .getCursorOver() method to act on the object being hovered over. We don’t bind this to any event just yet. This script is designed to be run in module mode, so we create a function called run() that just calls the cursor’s mouseEvents() function. The last 2 functions are designed to be called when the scene changes, by the new scene in a python module controller. Because the script is running in module mode own is still the cursor object. This sets up the context for the cursor’s operation. So when we’re on a menu screen we’ve removed any screen limits and set the .onCursorMovement() method to the new hover function we defined earlier. When we switch to the game scene we change .onCursorMovement() back to the .moveCursor() method. Each time, we’re making sure to update .searchScene. Using these functions we can easily use one instance of the Cursor class to respond to a variety of situations. I used an always sensor to trigger once to initialise the module, then the run() function we defined earlier will be called each time the mouse moves. You could just use an always sense set to true pulse mode as the Cursor.py module does not require any particular sensors/actuators. And that’s all there is to it. A completely, customisable, extendible, programmable cursor for the BGE. Have a look at the Duck Duck Moose game in the resources section below to see it in action. Then, providing you’re regularly running myCursor.mouseEvents() it’ll all work fine. This will have the advantage of having the object returned by myCursor.getCursorOver() being in the same script as other parts of the game code. This means that you don’t need to find a way to tell the object/game that something has been clicked on. However, when using this method you need to be aware of two things. Firstly, you need to make sure that the overlay scene has been initialised before trying to pass the cursor class the cursor game object. Secondly, you need to update Cursor.camera to the camera in the overlay scene (line 23 in the above example), otherwise the cursor position will be wrong. Hopefully, this custom cursor module is useful to people. There’s some bugs to fix and I plan to expand on it and increase it’s functionality (switching cursors, actually implement some error handling, more user control) so will add a post with the latest version when I do. I have other plans for using this cursor object as a base class for a more complex cursor system in a RTS game and will but forward a tutorial on it soon. Until then, any comments, requests for features, questions or noticed any errors, leave a note below. And don’t forget to check out the Blender page for other BGE/Python tutorials. ~ by Jay on May 5, 2014.